Since 1971, P.J. Mechanical Corp. has taken pride in the reliability and efficiency of our services and maintenance department. In addition to providing preventive maintenance programs for supplemental HVAC units, a full staff of service and supervisory technicians is available around the clock to ensure that our clients are never without service. 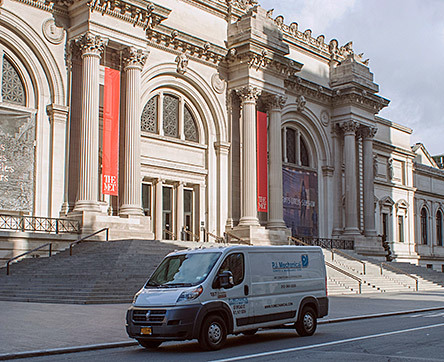 With a fleet of more than 60 fully equipped vans, our technicians are trained to service critical areas such as computer rooms, clean rooms, data centers and trading floors. PJ Mechanical Corp. offers a wide range of maintenance services aimed at providing concierge level and highly specialized programs for each client. Currently, we maintain more than 1,000 service accounts in the New York Metropolitan area alone. Our accounts range from small and large corporations, and span across numerous industries. Using fully developed, state-of-the-art CAD systems, PJ’s on-site service department creates HVAC control systems which keep our clients’ buildings up and running while using the most efficient energy sources to operate them.